As we had never been to Melaka, we decided to do a short drive up from the N-S highway on 15 Oct (abt 3hrs drive from Tuas 2nd link). It would have been fun if not for the fact that my car was broken into on the first night.....to think that I park at the damn hotel some more...really spoil the holiday...damn robbers, you stole my GPS, Subwoofer and mobile phone. 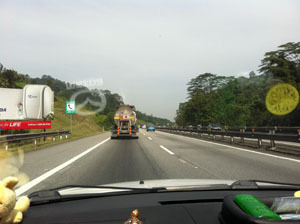 On our way to Melaka via the North-South Highway, customs clearance was a breeze as it was a weekday morning. Along the way, you will notice white and green markers on the divider. Green represents the KM mark and White represents the metres mark. A good way to know how far before you reach your destination. The speed limit is 110km/hr on the highway but you will see lots of vehicles travelling abt 150km/hr or more. A definite good way to clear carbon from your car engines...hehe. Our first rest point at Machap Rest Stop, it is approximately at the 74km mark. 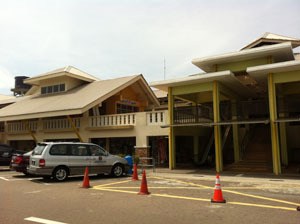 There is a nice toast-box like restaurant and food court at this location. I tried the toast and eggs here, it is actually not bad. Quite tasty. Our final stop at Pagoh (approx. at the 144km mark) before we drive all the way to Ayer Keroh, Melaka. 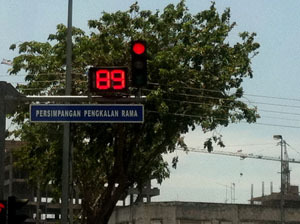 The locals call it "Melaka". 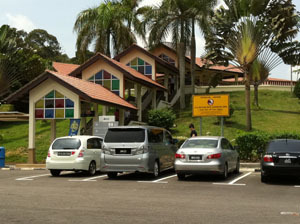 Along the way, there are 3 toll stations, so prepare about RM50 for 1 way trip. On this trip, went up with another 2 friends in their red Mazda2. 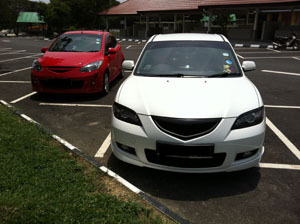 Check out our rides, our trusty Mazdas. 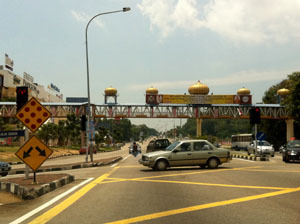 At the outskirts of Melaka town. Traffic is considered relatively smooth into the town area. 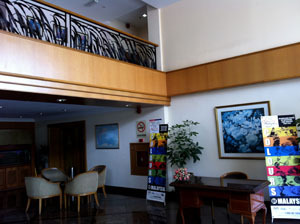 It is a definite no frills hotel.